The former medium pacer said that Sadeera Samarawickrama getting bowled off Ishant Sharma was a poor judgement. 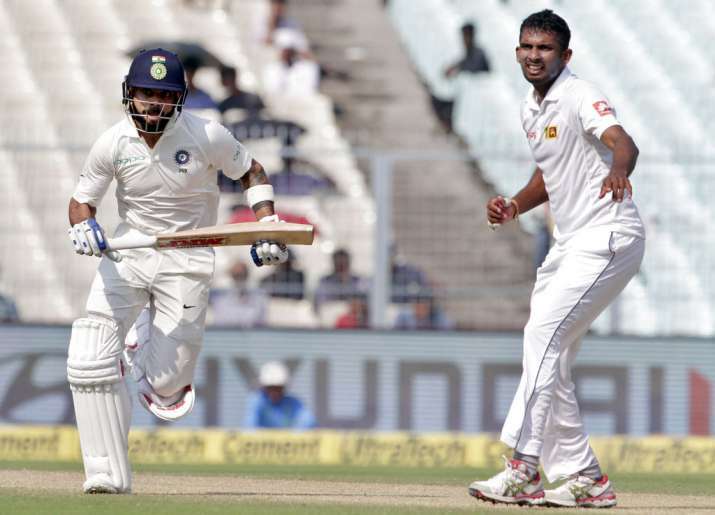 Image Source : AP India's Virat Kohli runs between the wickets on Shanaka's delivery. Sri Lanka bowling coach Rumesh Ratnayake today expressed concern that his bowlers have not been able to take 20 Indian wickets for five consecutive Test matches. "We came quite close in the first Test and people then said that it was a green track. We took 17 wickets in Calcutta (Kolkata). I am not trying to say that we have the best bowlers but we have to do things in a way so that we get the best results. It is a concern," Ratnayake said after the third day's play of the second Test. "In today's context, we have not done well. I would like to still encourage the bowlers saying that they have slowed the process a little bit. We need to take 20 wickets and that's for sure," he added. Asked if the effort was lacking, he said: "The whole system has to think of that. What we have for the tour is what we have. We have to manage with that. With the past record in Sri Lanka against India, we have done quite well as they scored 600 in 176.1 overs compared to some of the efforts in the past where it was much quicker. "I am not taking that as a huge compliment as a fast bowling coach. This is what we have. First and foremost we have to say that it was a good track and we should have put on more than what we have done. India showed that." "I thought the decision to leave the ball was poor. He left the first ball and he perhaps thought the ball was going away. It was a bad judgement. The other two were trying to be positive. That is what we are trying to do. We are going to play in sessions. We will break sessions into portions and we will try to win that," he said.